The Year of the Rabbit is almost here! Photo by Bert Kimura via Creative Commons. There are quite a few activities on and near the Hill today and tomorrow. Here’s the list. Tonight, January 28, the Southeast Seattle Senior Center is hosting Burgers, Bingo, and Brews, an evening of fun with bingo (for money!) and the aforementioned food and beverages from 6:30-9:30 p.m. There will be soft drinks, too. Admission is a $15 donation. The Center is at 4655 South Holly Street in Rainier Valley. Call SESSC at 206-722-0317 for more information. Tomorrow, January 29, local grassroots project Got Green will launch “Women in the Green Economy,” a new project to learn from women in Southeast Seattle what they need and want from the “green movement” for themselves and their families. Volunteers will survey women in the New Holly neighborhood about their needs and priorities for the Green Economy. 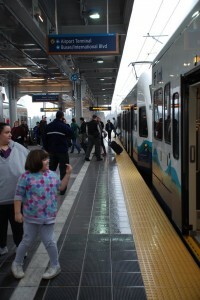 The project is funded in part by a Neighborhood Matching Fund award of the Seattle Department of Neighborhoods. The project will launch with a reception at 10:00 a.m. at The Lee House at New Holly, 7315 39th Avenue South. At noon, volunteers will go out to collect surveys at various southeast Seattle sites. For more information, go here. Also on Saturday, ROCKit space is holding a moving sale from 12 to 5 p.m. Betty Jean Williamson tells us “We have art supplies, office supplies, furniture, collectibles, music gear and reall cool stuff! We can use all the help we can get this weekend, Saturday-Monday, if anyone out there wants to give us a hand. Volunteers are very much appreciated. They might even get pizza! Call us at 206-323-7115 or email us at rockitspace@gmail.com for details.” ROCKiT space is, for now, at 3315 Beacon Avenue South. The celebration will take place from 11 a.m. to 4 p.m. at Hing Hay Park, Maynard Avenue South and South King Street. Walking and driving have been treacherous during our recent cold snap, particularly in places like this 14th Avenue location where there seems to be some kind of water leak. Photo by Robert Kangas in the Beacon Hill Blog photo pool on Flickr. The Friends of Cheasty Greenspace at Mt. View, together with Cascade Land Conservancy and Washington Conservation Corps, are co-hosting a Martin Luther King Jr. service day on Monday, January 17 from 10:00 am to 12 noon. All are welcome to help, including families with children (it’s a school holiday). To participate, meet at 2809 South Alaska Place, one block west of Columbia City Station. Volunteers will work on forest restoration and invasive species removal. Gloves and tools will be provided. Mmmmm, pancakes. MMMMMMMMmmm, all-you-can-eat pancakes for $5! The Cleveland High School softball team is hosting a pancake fundraiser on Saturday, January 9 from 9:00 – 11:00 am. Breakfast is served at the Cleveland cafeteria, the same building where the gym is located. Questions? Email Kyrsten at klpratt@seattleschools.org. We previously mentioned that Gage Academy of Art is offering free drop-in art classes for teens aged 13-18 in the Rainier Valley. We have more information about the classes now. January’s classes are “Imaginative Plaster Forms” with Katrina Wolfe, February’s are “Cut It Out” (cut paper in two and three dimensions) with Celeste Cooning, and March features “Explorations in Paint” with Jeanne Dodds. Classes are on Saturdays at The 2100 Building, 2100 24th Avenue South. Classes will be from 6:30 pm – 9:30 pm. For more information, call 206-323-GAGE. Art materials and pizza will be provided. There is a new Yahoo group/listserv for Beacon Hill parents. Go here to join and chat with your fellow parents in the neighborhood. Unfortunately, author Valerie Easton seemed a bit put off by the Hill’s topiary art. The Times is also hosting a “map the potholes” project. There are a few Beacon Hill potholes already included, such as the “giant holes heading west on Holgate at approx 14th” (we hit that one a couple of weeks ago—ouch! ), but if your most annoying tooth-rattler isn’t listed, please add it. There’s a yoga and EFT Workshop, “Rejuvenate your Energy in 2011,” this Saturday, January 8 from 9:00 am to 2:00 pm at the Jun Hong Kung Fu and Sports Association, 4878 Beacon Avenue South. Find out more and register for class on the event website. 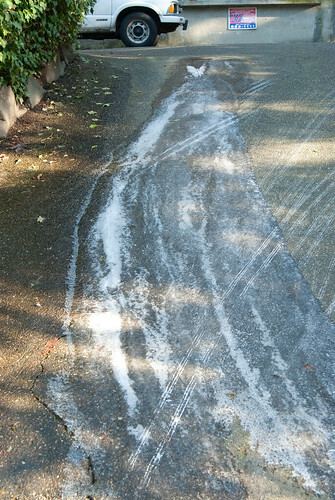 Neighbor Robert Kangas has noted some extreme water leakage along 14th Avenue South, west of Jefferson Park. The leaks caused some dangerous ice patches. He posted a series of photos here. In discussion on the Beacon Hill mailing list last week, some folks noted a history of artesian wells on the Hill, and suggested that these are the source of some of the leaks around the neighborhood. Others think it’s a leaky water main. If you notice a potential water leak on public or private property, you can report it by calling 206-386-1800, and Seattle Public Utilities will then check it out. The Seattle Department of Neighborhoods is hosting three free workshops to educate neighborhood groups and community organizations on the funding process and requirements for the Large Projects Fund, the matching fund that awards up to $100,000 for community projects. Next Tuesday, January 11, there’s a workshop in Southeast Seattle, at the Rainier Community Center, 4600 38th Avenue South. The workshop is from 6:00-8:00 pm. More information about the Large Projects Fund and the three workshops may be found here. Sustainable South Seattle is hosting the third of a workshop series dedicated towards creating a climate co-op for South Seattle neighborhoods. The event is Wednesday, January 26 from 6:00 – 8:00 pm at the Southside Commons, 3518 South Edmunds Street. Food, refreshments, and childcare will be provided. Please RSVP by emailing climate.coop@gmail.com. Men and women who are positive, fun and excited about performing and singing harmony. We will possibly be doing 1 to 2 gigs per month starting in the Spring. See the ad for more info. A couple of changes to liquor licenses on the Hill occurred last month. The Station coffee house at 2533 16th Avenue South was approved for a license as a “direct shipment receiver – in WA only.” But every new beginning is some other beginning’s end: on the same day, the liquor license for the ill-fated Tasha’s Bistro Café was discontinued.